If you have a pizza dough recipe…we want it here! First, is there a difference between any regular pizza dough for kitchen ovens and those for wood fired brick ovens? I don’t think there is. What I know is that the outcome from making pizza, is that the dough rises faster, the texture much better and the pizza taste super in a wood fired brick oven. Any recipe will do but I do have one that came with my woodfired oven construction plan. I share this to most people I know who’s been asking and they do have great success with it. It’s easy to mix and taste good. It has been my favorite pizza dough recipe for over a decade now. And I’m glad to share them with you here. From the book it made mention one of the biggest flaw in most pizza dough recipe. That is the failure to allow the dough to rest overnight in the refrigerator or letting it rest for a long time. This delay will make the enzymes go to work further and pull out the subtle flavor trapped in the starch. Stir together flour, salt and instant yeast in a 4-quart bowl. With a large metal spoon, stir in oil and cold water until all the flour is absorbed. Switch to dough hook and mix 5 to 7 minutes. Divide dough into six pieces and put on a parchment paper sprayed lightly with oil. Sprinkle flour over dough making sure dough’s are not sticking to each other. These are now dough balls…Place dough lightly covered in the refrigerator overnight. 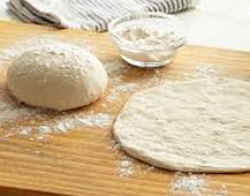 Remove dough 2 hours before making pizza. Gently press dough in the middle and shape into five inches flat disk. Cover lightly spray oil and flour and let it rest for another 2 hours. After that put your toppings, bake in 500 degree oven and enjoy. It takes time alright, but with planning, the result is and amazing pizza experience. There you go…my favorite pizza dough recipe.